In early April, Julie Schoen received a troubling call: A funeral home director had received the body of an elderly person who was covered with excessive bedsores. The director suspected abuse. Schoen, a director of the Center on Elder Mistreatment at the USC Keck School of Medicine, gave him a few contacts and walked him through the steps to report it. She said that while the incident is an extreme case, complaints about elder abuse are common and often stem from a “deep-rooted ageism” in our culture. According to California law, “elder abuse” involves physical or emotional abuse, neglect, or financial exploitation of people who are 65 years or older. The Los Angeles Sheriff’s Department filed 6,008 reports of elder abuse from across Los Angeles County last year — an 11% increase from the 5,406 incidents in 2017. 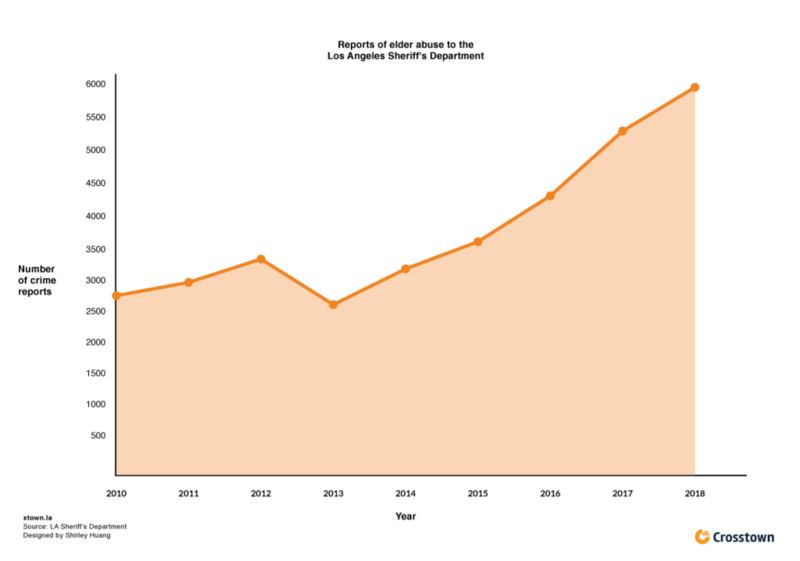 Data from the Los Angeles Police Department show that in 2018, 191 elder abuse incidents were reported in the City of Los Angeles alone, an uptick of 18% from the previous year. Schoen also said that she often receives calls from residents at elderly housing facilities who notice a neighbor who is either being shouted at by staff or is rapidly losing weight, which might indicate that they are not being fed properly. People aged 65 and older currently account for about 15% of country’s population and is slated to grow to nearly 20% by 2060. The rising number of elderly using the internet and social media have also contributed to an increase in elder abuse incidents. The National Center on Elder Abuse, part of the U.S. Administration on Aging, conducted a survey of 28 adult protective services across the nation and found a correlation between elder abuse and the opioid crisis: People addicted to opioids sometimes move in with their elderly parents and then steal their medicines or money to fuel their addiction. She also said that scams and financial crimes against the elderly, while preventable, are common. The publicly available data from the Sheriff’s Department do not distinguish between financial and physical crimes against the elderly. 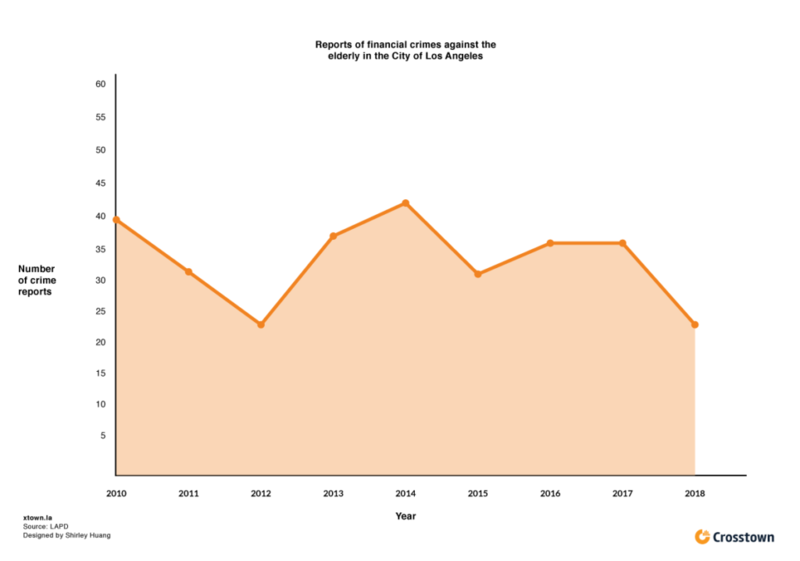 Separate data from the LAPD show that in the City of Los Angeles 24 incidents of financial elder abuse were recorded last year, down from 36 in each of the two previous years. Both Los Angeles city and county have started undertaking awareness campaigns and partnering with nonprofits to do just that. The most common form of abuse is physical abuse. Some incidents also result in death. Elder Abuse Hotline: Call 1-877-477-3646 or 800-992-1660 to report allegations of abuse when you are unsure on where to call. Adult Protective Services, County of Los Angeles: Call 1-888-202-4248. Call 213-351-5401 if you are outside of Los Angeles County. Long-Term Care Ombudsman, at WISE & Healthy Aging: Call 800-334-9473 to report suspected abuse occurring at board and care homes, nursing homes and assisted living facilities in LA County. Statewide Ombudsman after hours crisis line: Call 1-800-231-4024. California Attorney General Bureau of Medi-Cal Fraud & Elder Abuse: File a complaint at oag.ca.gov/bmfea/ or call 800-722-0432. How we did it: We looked at publicly available LAPD and L.A. Sheriff’s Department data of reports of elder abuse in the City and County of Los Angeles. Learn more about our data here. LAPD data and LASD logs only reflect incidents that are reported to the respective departments, not how many crimes actually occurred. In making our calculations, we rely on the data that the departments make publicly available. On occasion, LAPD or LASD may update past crime reports with new information, or recategorize past reports. Those revised reports do not always automatically become part of the public databases.